UH physicist Shay Curran developed the nanocoating and led the development of a spin-off company based at the UH Energy Research Park. Integricote’s sealers and stains for wood, masonry and concrete will be distributed by Binford Supply, a Dallas-based construction supply firm, under the name CaraPro. The coatings will continue to be produced in manufacturing facilities at the UH Energy Research Park on the Gulf Freeway. Carlos Ripley, senior manager of Binford’s Houston facilities, said they will be available at both Binford locations in Houston. 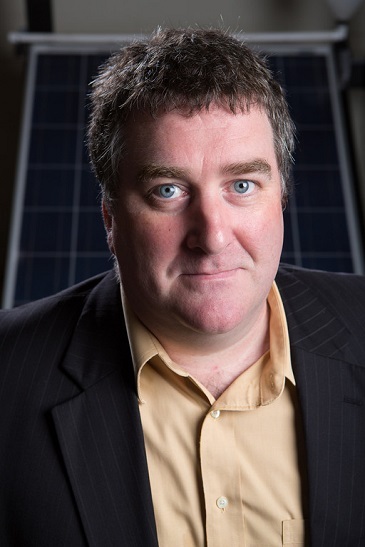 The company launched as C-Voltaics in late 2013, based on a water- and stain-repellant coating developed by UH physics professor Seamus “Shay” Curran. A shift in focus and name change later, Curran says he has learned a lot about start-up companies and why successful nanotech launches have been relatively rare. Commercializing nanotechnology is a big national effort, and as Curran has learned, it is not easy. The federal government has invested more than $20 billion in nanotechnology research and development through the National Nanotechnology Initiative. Ramanan Krishnamoorti, interim vice president/vice chancellor for research and technology transfer at UH, said having a good product is just the first step. Curran, a faculty member in the UH College of Natural Sciences and Mathematics, developed the coatings in conjunction with his work on portable, solar-powered generators. Solar panels work best if their surfaces are clean, and the coating protected against dust, pollen, water and other pollutants. When he formed the company, Curran intended to focus on a coating for fabrics. The product quickly drew praise – C-Voltaics received the 2013 Young Technology Award at the Commercialization of Micro- and Nanosystems conference, a competition for nanotechnology companies that are less than 10 years old. It also received the 2013 Goradia Innovation Prize, which recognizes innovations from the Houston Gulf Coast region. Late last year, the board of directors decided to change the name to Integricote and to focus on a coating for wood and stone products. That required a shift in the chemical makeup of the coatings, which are marketed under the name CaraPro – “cara” means “friend” in Irish, Curran’s native tongue. Curran said production capacity is about 5,000 gallons a week. Steve Walsh, professor at the University of New Mexico’s Anderson School of Management and a member of the Integricote board, said the first contract signed signals that Integricote has overcome concerns that typically accompany any new technology. The larger rewards may lie in the future, he said, noting that small companies are the largest job generators in the United States. “I think for the Houston area, this is one that might do that,” he said.